It is not original item from Samsung Canon Nikon Panasonic Sony Olympus etc! only compatible! Compatibility：Canon PowerShot SX510 HS, EOS 700D, EOS 100D, SX50 HS, G15, 6D, SX500 IS, 650D, 60Da, 5D Mark III, 1D X, 1100D, 600D, 60D, 550D, 1D Mark IV, 7D, 500D, 1Ds Mark III, 1D Mark III, 5D Mark II, 50D, 40D, 450D, 400D, 1000D, PowerShot SX500 IS, SX40 HS, SX30 IS, SX20 IS, SX10 IS; Nikon Df, D3300, D5300, D610, D7100, D5200, D3200, D800, D4, D5100, D7000, D3100, D3 S, D300S, D5000, D3000, D3x, D3, D700, D300, D200, D90, D80, D60, D40, D40x, D2Xs, D2Hs; COOLPIX P7800, P600, P530, P520, P510, P500, P100, L830, L820, L810, L310, L120, L110, L100; PanasonicDMC-GM1, DMC-GX7, DMC-G6 ,DMC-GF6, DMC-LZ20, FZ6K0(FZ62), FZ72, GX7, FZ200, FZ150K, FZ47(FZ48), FZ40(FZ45), FZ100, FZ35(FZ38), LX5K, LX7, DMC-G5, GF5, G3K, GX1, GF3C, GF3, G3; FujiFilmX-T1, S9400W, S9200, S1, S8600, X-E2, X-M1, FinePix S8400W, S4800, S6800, S8500, S8200, SL1000, HS50EXR, X20, X100S, S4200, S4500,SL300, HS25EXR / HS28EXR; Sony RX10, Alpha 7R, Alpha A7, HX300, HX200V, H200, HX100V, NEX-3N, NEX-F3, SLT-A37, A58, A57, A65, A35, A33, A55, a580, a560, DSLR-A390, DSLR-A290, DSLR-A550, DSLR-A380, DSLR-A330; Samsung NX10 NX20 HZ25W HZ50W GX20 GX10 etc. It is not original item from Samsung Canon Nikon Panasonic Sony Olympus etc!, only compatible! about 90 cm(long)( the main part: 30cm x 2; black band：15cm x 2) x 3,80cm W (the main part). 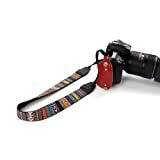 Beiuns® Universal Hand Strap Grip for DSLR SLR Camera Canon Fujifilm Leica Nikon Olympus Panasonic Pentax Ricoh Samsung Sony etc. This entry was posted in Discount Photography and tagged Beiuns®, Belt, Bohemian, Camcorder, Camera, Canon, DSLR, Fujifilm, Grip, Leica, Neck, Nikon, Olympus, Panasonic, Pentax, Retro, Ricoh, Samsung, Shoulder, Sony, Strap, Style by Ball Photo. Bookmark the permalink.